On April 13th Bale Breaker Brewing releases Fresh off the Farm IPA to commemorate its fifth anniversary. They’ll distribute cans and kegs of the beer across Washington. Beer fans are welcome to join Bale Breaker Brewing at the newly expanded taproom near Yakima April 13th thru 15th to celebrate the milestone. In 2013 Bale Breaker set up shop in hop field 41 just outside of Yakima, the first brewery I’d ever heard of built in the middle of a real hop field. It didn’t take long for it to earn a reputation for its outstanding beers, especially those featuring lots of hop character. In just five years Bale Breaker has grown into one of Washington’s best-loved breweries. Congrats to the team! 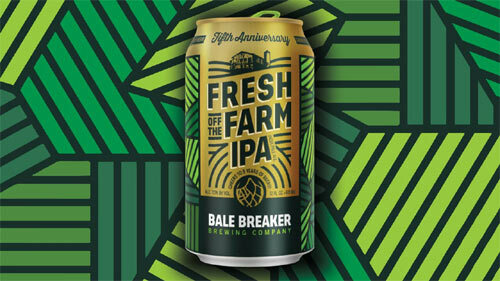 Bale Breaker is releasing Fresh off the Farm IPA in cans and kegs throughout Washington on April 13 to celebrate its fifth anniversary. Fresh off the Farm IPA debuted at the 2017 Seattle Beer Week. “This beer had a lot of fans, and we knew we wanted to find the right opportunity to brew it again. Fresh off the Farm IPA celebrates our brewery’s location in the middle of hop field 41, so the brewery’s fifth anniversary is the perfect occasion,” said Kevin Quinn, co-owner. Bale Beaker’s 5th Anniversary Celebration will take place April 13-15 at the recently expanded Taproom in Yakima. Fresh off the Farm IPA will be available in six-packs and on tap, and guests are invited to dress to impress in Bale Breaker gear. Chronic Foods will be on site April 13 and April 14. Bale Breaker opened in 2013, backed by four generations of hop farming experience. The Brewery has grown to become the fifth largest independent craft brewery in Washington. With a 30-barrel brewhouse at a 27,000 square foot facility, Bale Breaker crafts four year-round canned beers, including the widely celebrated Topcutter IPA, and a diverse offering of seasonal beers in kegs. The recently expanded onsite taproom hosts frequent food trucks and events, with a beautiful outdoor patio and lawn area, perfect for enjoying the Yakima sunshine. Fresh off the Farm IPA (7.0% ABV 60 IBU) was brewed in the center of hop field 41, just minutes from downtown Yakima, by Bale Breaker Brewing Company. A big hop aroma on a clean Pilsner malt base perfectly showcases a few of the newest and most exciting hop varieties off their family’s hop farm. Whirlpool additions of Loral™ and Mosaic® add depth to the nose generated from a post-fermentation charge of Mosaic® and the experimental HBC 630.